DeviceLock endpoint leakage prevention software enables security administrators to centrally control, log and audit end-user access to peripheral devices and local ports from enterprise systems. Native integration with Microsoft Active Directory® results in easy deployment and administration, while comprehensive event and shadow logging provide invaluable information for verifying security standards compliance. 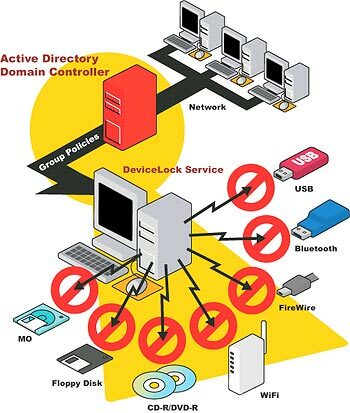 DeviceLock endpoint leakage prevention software enables security administrators to centrally control, log and audit end-user access to USB and FireWire devices, WiFi and Bluetooth adapters, CD-ROM and floppy drives, and serial and parallel ports. DeviceLock also supports PDAs, smartphones and many other plug-and-play devices, as well as blocks USB and PS/2 hardware keyloggers. Using Microsoft Active Directory® integration, DeviceLock can be deployed, managed and administered completely from within an existing Microsoft AD installation without an additional management server. At the same time, DeviceLock supports non-Active Directory environments with the full set of management and administration functions available through the DeviceLock Enterprise Manager server. Among many DeviceLock’s advantages are its ability to generate comprehensive logs of all user activities related to locally connected devices and its ability to shadow-copy any data that users export through local ports and interfaces of their computers. This includes unique support for event logging and data shadowing covering any printing operations and local synchronizations between corporate PCs and employees’ personal mobile devices that run Windows Mobile or Palm OS. All event and shadow log data are automatically collected to a central server and stored in Microsoft SQL or any existing ODBC-compliant SQL database. The data can be reviewed through built-in audit log and shadow log viewers. This comprehensive event and shadow log central repository contains invaluable information for verifying an organization’s compliance with applicable governmental and business information security standards, managing corporate security policy, and auditing end-user and DeviceLock administrator activities. The event and shadow log can also be used to detect negligent and accidental mistakes, investigate deliberate misconduct or malicious action, perform forensic analysis, and extract evidential materials for criminal proceedings. Since its inception in 1996 as SmartLine, DeviceLock, Inc. has been providing endpoint device control software solutions to businesses of all sizes and industries. Protecting more than 3 million computers in over 55,000 organizations worldwide, DeviceLock has a vast range of corporate customers including financial institutions, state and federal government agencies, classified military networks, healthcare providers, telecommunications companies, and educational institutions. DeviceLock, Inc. is an international organization with offices in San Ramon (California), London (UK), Ratingen (Germany), Moscow (Russia) and Milan (Italy).